In Part 3 of this series we look at setting up Kerberos Authentication in the simplest possible scenario. If you missed Parts 1 (What is Kerberos and how does it work) and 2 (Service Principal Names) they may be worth reading first. In this scenario, we have a client, a DC and a single IIS server. As we progress through the series, we will progressively add more elements into the mix. 6) The webserver determines the identity of the client, checks the ACL on the resource and either permits or denies access to the resource. In order for this sequence of events to work the following need to be configured. Under Tools -> Internet Options -> Advanced the option "Enable Integrated Windows Authentication (Requires Restart)" must be checked. Whilst technically IWA encompasses both NTLm and Kerberos, IE will use NTLM only if this option is not checked whilst it can use both Kerberos or NTLM if this option is checked. For the Domain Controller to generate the appropriate tickets to give to the client an appropriate Service Principal Name (SPN) must be registered in Active Directory. When a Windows Server 2003 machine is added to a domain, a HOST SPN for both the NetBIOS name and the FQDN of the server is automatically added to Active Directory. If your website is accessible at http://servername or http://servername.domain.tld (tld = Top Level Domain, such .com or .local) and the web application pool is running as Network Service, Local Service or Local System, you do not need to change any SPNs. If the web application pool hosting the site is running under a custom account, the SPN HTTP/servername or HTTP/servername.domain.tld needs to be registered under that custom user account. If those HTTP SPNs exist under any other account, they need to be removed. And lastly, if the website is accessible at an arbitrary hostname that is unrelated to the actual server’s name (e.g. www.domain.tld) then a SPN needs to be registered for that hostname. 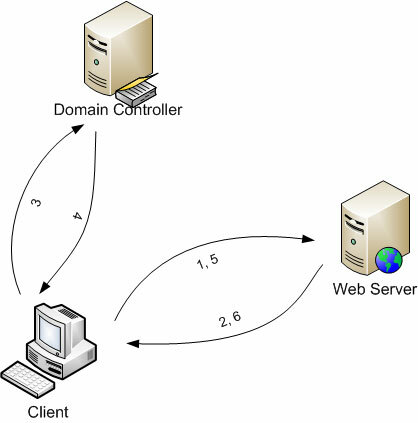 If the web application pool hosting the website is running as Network Service, Local Service or LocalSystem, then the SPN needs to be registered under the server’s computer account. If the web app pool is running under a custom user account, then the SPN needs to be registered under that user account in Active Directory. There isn’t a lot to configure on the IIS Server. Firstly Integrated Windows Authentication (IWA) should be enabled for the website or application you are seeking to protect. By default this enabled both the Negotiate and NTLM Authentication Providers in the IIS metabase. If you have edited the metabase to remove the Negotiate provider, you will need to add it back in. The installation of some products (e.g. Sharepoint Portal Server 2001) removes the Negotiate provider – you may need to manually add it back in. See Microsoft KB Article 832769 for your options. Secondly, all web applications hosted at the DNS name in question need to be running in one or more web application pools that are all running under the same user account. It’s easiest if all the web applications at that DNS name are running in a single web app pool. However if you do need to split web applications into multiple pools, those pools need to be running under the same user account. And that should be all that is required for your Internet Explorer browser to authenticate to IIS using Kerberos. To verify whether this is occuring, you can use the tools described in my previous post on determining whether the browser is using NTLM or Kerberos to authenticate to IIS. This post overall is pretty good, but I'd like to point out a minor correction that's led to confusion in the past. Internet Explorer does not support the "WWW-Authenticate: Kerberos" header. It does support "WWW-Authenticate: Negotiate". The setting "Enable Integrated Windows Authentication" controls whether IE responds to the Negotiate headeror not. This is particularly important because of one shortcoming of IE's authentication. Since the Negotiate SSPI supports both Kerberos and NTLM, IE has the choice when presented with the Negotiate header of which authentication protocol to use. If you've set up your server and client correctly to enable Kerberos auth, it will use Kerberos over Negotiate; if you haven't, you'll get NTLM over Negotiate. The shortcoming is that there's no mechanism to restrict the Negotiate package to use only Kerberos, never NTLM. Certainly there may be other browsers that support the actual Kerberos header (I don't know any offhand, but at least theoretically they could). I see that you've modified the post not to mention IE specifically with it. Thanks. I got asked a question about this at work that referenced this blog post, so I thought I'd comment here. If my memory serves, ISA server doesn't do WWW-Authenticate: Kerberos, but instead Proxy-Authenticate: Kerberos. Furthermore, again if I remember correctly, that header is used for authentication between two proxies (not between a client and the proxy). I didn't modify my blog post - all I did was respond to your comment. Not sure what you think I may have been doing here :-) If I modify a post (other than spelling mistakes) I put some "Edit:" text in as a change log. In terms of ISA Server 2006, I have a packet capture here that shows it is definately sending back a WWW-Authenticate: Kerberos header. I am happy to send your the .cap file if you can send me your contact details. Use the Email link up the top of the page to send me your preferred contact address.